Polyform is a product used extensively through Europe where the use of lead has been banned for many years. The wall and chimney flashing is made of PIB compound and is fully covered with butyl. The product has huge benefits compared with any other product available. The benefits of being able to stretch 70% allow the product to be malleable when required. 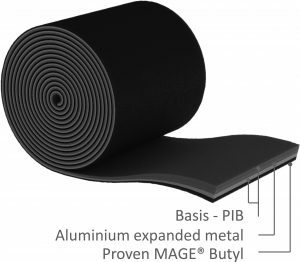 Its fully covered butyl adhesive backside allows the product to form the substructures for optimal sealing. 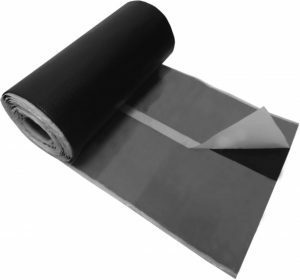 Its application is made easy due to its split release protective foil. Polyform has a 50% time saving compared to lead installations. It has no leaching of environmentally harmful pollutants. Polyform has no scrap value and covers a greater area due to its lessor overlap. Polyform is lighter and can be laid in 5 metre lengths with a 50mm overlap.